To make our rose water, we use the finest rose absolute (Rosa damascena) and disperse it in water. The rose water is made in small batches and added to our fresh handmade products at the factory. Rose water became a favourite in cooking and beauty; it is used in traditional Turkish Delight, in Indian cooking and in Greek baking - and its application in cosmetics has been widespread from cold creams to soaps. Rose water's ability to soothe the senses and skin has been recognised for centuries. 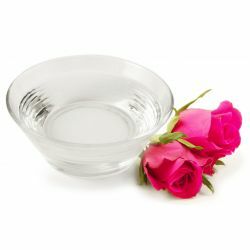 Rose water helps to retain moisture and is mildly astringent, which helps to even skin tone and improve its appearance. These qualities make it an excellent ingredient for a shaving cream and for any product aimed at calming skin. Rose absolute is made up mainly of citronellol and geraniol, but rose absolute is an extremely complex essential oil with around 300 known constituents. In aromatherapy treatments, rose absolute is used as a tonic for mature skin and to treat depression, sadness and grief. We use rose water as a skin and hair tonic in many of our products - and you’ll also find it in our lightweight and nourishing moisturiser, Vanishing Cream. Just like its sweet namesake, our Turkish Delight shower smoothie contains rose water. The effect is calming and soothing.